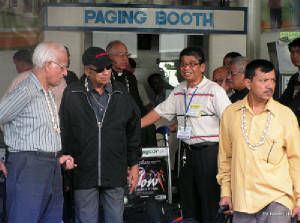 Coming Together on August 10, 2009 at NAIA 1 to serve and welcome the Asian Bishops. 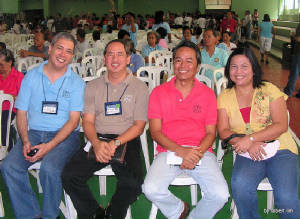 EVANGELIZATION RALLY, JANUARY 25, 2009 AT BGY. 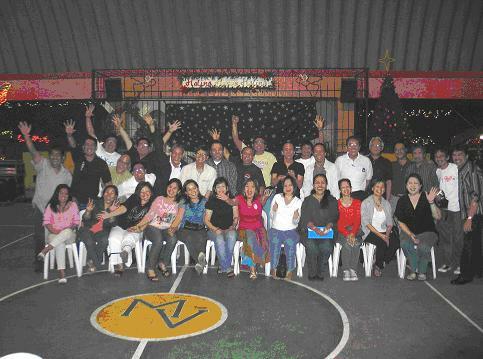 SAN JOSE COVERED COURT, PASIG CITY With Bro. Pancho Lopez-Tan delivering the message of trusting in the Lord to proclaim the gospel to the whole world without fear and with confident faith. Sounding off just a week prior to the affair, the call for this particularly unique Music and Praise Party came in a bit late so it was quite expected that not many people would make it to the event. 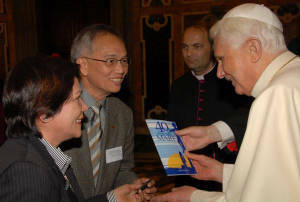 Looking back, it was almost as if the night would not even transpire at all due to the numerous perceived barriers that gave hint of hindrance to any possibility of staging the modest and unconventional gathering. It was mid-December after all and every other person we know was either going to attend a Christmas party some other place or was going to host one. But happen, it did… and everyone who went there, albeit few in number—were glad they came. Unusual as it may have been, the event held the night of Dec. 18 2008 in a Marikina Village Clubhouse saw a rare but definitely Spirit filled gathering of Music Ministry people from both sides of CFC as FFL minstrels met with their Global counterparts and shared a wonderfully sentimental evening of music and praise… together! Seemingly like a family living away and separated from each other for some time---no walls, fences nor borders (imagined or otherwise) were strong enough to keep everyone who came in that night from warmly embracing siblings as brother found brother and sister found sister and everyone else found each other.As the night went on, Praise music, both old and new-- were randomly mixed in with regular secular numbers as the bands led by Tony Cruz of FFL and Rey Peralta from Global joyfully shared playing time for the night with songs from the 70’s and 80’s thrown in the mix. Lito Legaspi’s group, from Global as well, added their own touch to the evening for some added 60’s flavor. In the end, the evening was closed with a beautiful Praise Session that despite being short as it was — ultimately became the highlight of the affair as music ministry brethren from both sides held hands together again after so long --and with hearts full – worshipped as one! Sharing the same songs and most of all, the same prayers… it was quite plain to see the Spiritual lineage of each one who was there that night. As summed up by both Glen Angeles from FFL who led the worship and Thess Lugue from Global who helped make the arrangements, the evening was neither about issues nor walls nor of barriers. It was all about the Spirit which has led everyone that night to come together in united celebration of Christmas with friends and family. A graphic artist need not have to weave his magic to assemble a bevy of personages representing the Church, State, CFCFFL and CFC Global in one picture. A single click with a camera is all it takes to affirm that differences in beliefs and priorities are not obstacles to progress. 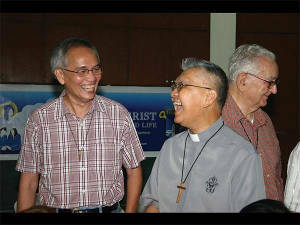 The event: groundbreaking ceremonies for a new convent in Greenwoods Executive Village (GEV), Cainta, Rizal. 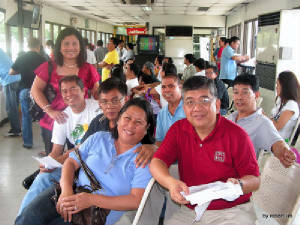 Timestamp: November 30, 2008 at 10:00 AM. 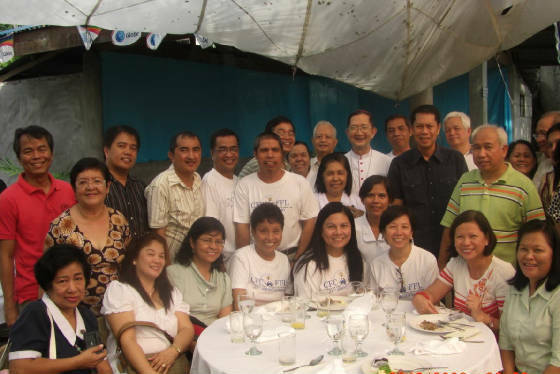 The residents of GEV led by the Chapel Pastoral Committee and supported by the CFC family, initiated a move to upgrade its mini parish into a full parish under the Archdiocese of Antipolo. Prerequisite to this is the construction of a convent within the confines of the chapel. 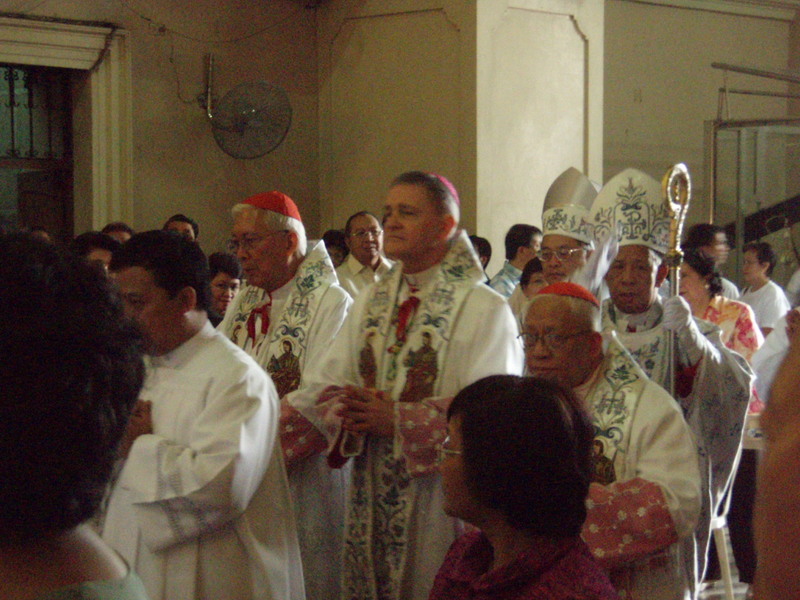 On November 30, 2008, coincidentally the feast day of San Andres Apostol, the village’s patron saint, Bishop Gabriel Reyes officiated the 8:00 AM mass and the CFCFFL Greenwoods choir accompanied the rites. 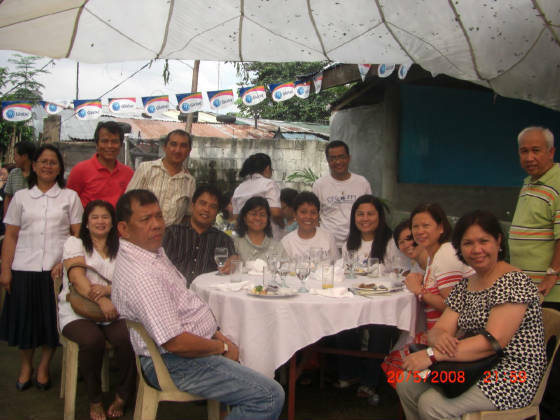 A simple groundbreaking ceremony ensued followed by a sumptuous meal and joyous fellowship. 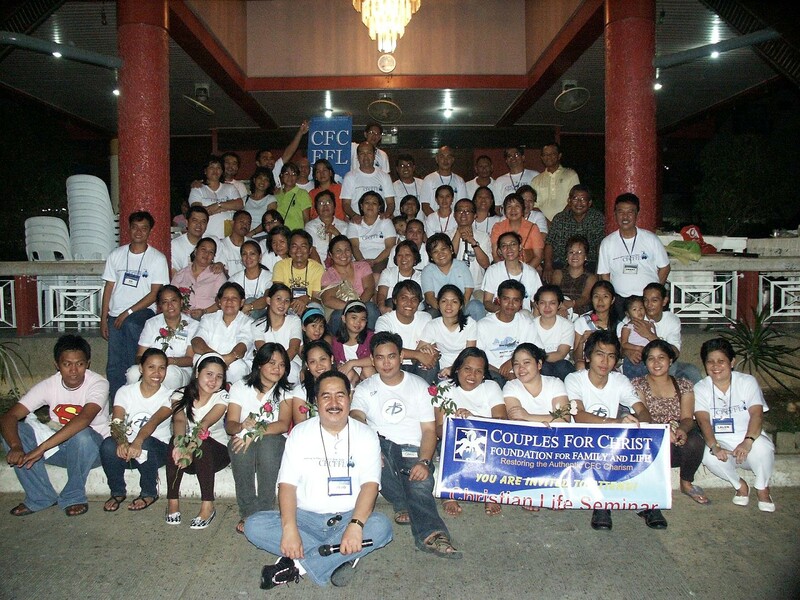 Shown in picture is Bishop Reyes, Mayor Mon Ilagan of Cainta, the CFCFFL group led by Pasig District head Gary Guarnes and wife Arlene, Chapter head Danny Amul and wife Nora, CFCFFL-EFI Full Time worker Manny Estrella and wife Vangie, Chapel Temporalities head Choi Joaquico and wife Marge. 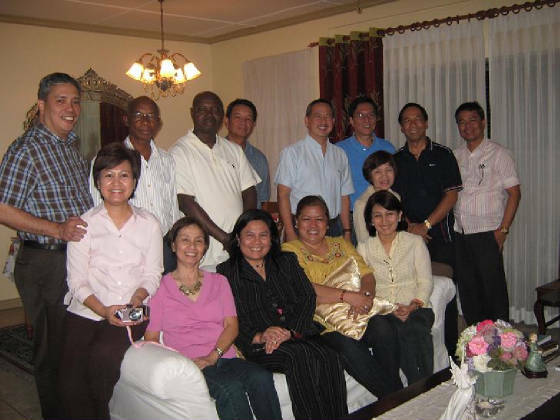 Also present are our CFC Global brethren Ed & Bless Perona, Gerry & Tess Ravida, and Ted& Lap Azores together with the rest of the officers of the Chapel committee. Another click, please? 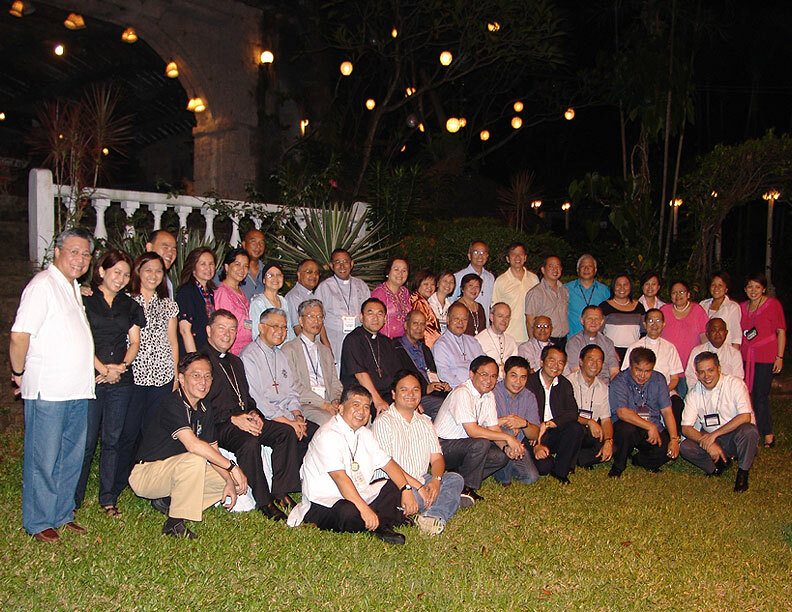 25th Anniversary of Most Rev. 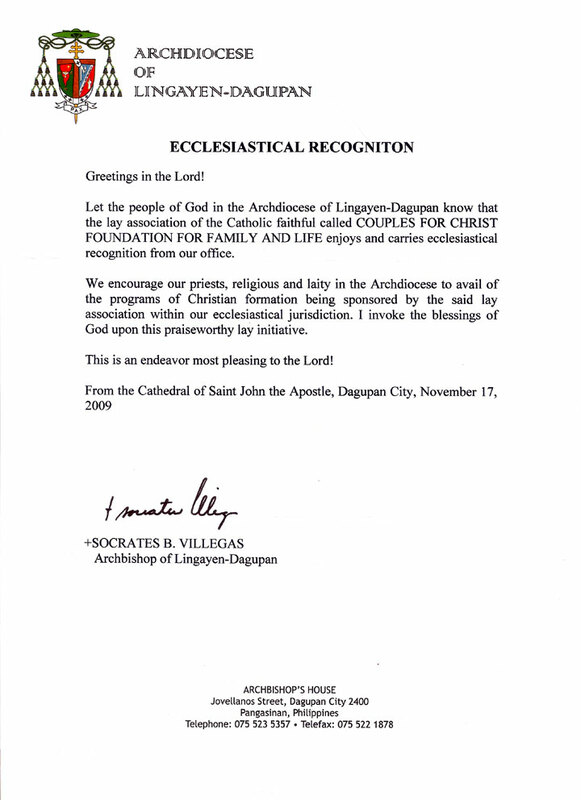 Francis San Diego on his Episcopal Ordination as Bishop at the ICC last August 9, 2008.
last June 6, 2008 at the Immaculate Concepcion Cathedral. Click here to view other photos.